Inflation is such an acute everyday aggravation that it becomes all too easy to forget that devaluation might well be twice as fast – around 70 percent by the end of the year according to various estimates. The New England economist Dr Hale cannot help feeling that he has picked the wrong profession for analysing Argentine news over the last week. “Just because there is a strongly moralistic undercurrent to almost everything written about corruption and abortion does not exclude both issues having their economic as well as ethical aspects. It should be obvious enough that corruption entails certain sums of money and percentages of gross domestic product, not to mention a further disincentive for overseas investment. “The economics of abortion is considerably more complex. Those who look beyond the fundamentally moral and existential questions (which nobody should ever forget) tend to see President Mauricio Macri’s surprise initiative in opening up the debate of this taboo last March as a political move – an attempt to woo the progressives in Kirchnerism and other opposition groupings while taking care not to alienate the more conservative wings of his centre-right coalition (an extremely tricky juggling act which could hardly have worked out better with the combination of lower house passage and Senate defeat of the bill). The only way that economics enters this political interpretation is as a distraction from all the problems accompanying the financial crisis dominating the second quarter of this year (weeks after Macri’s state-of-thenation address – containing the abortion initiative – had also proclaimed: ‘The worst is over.’). 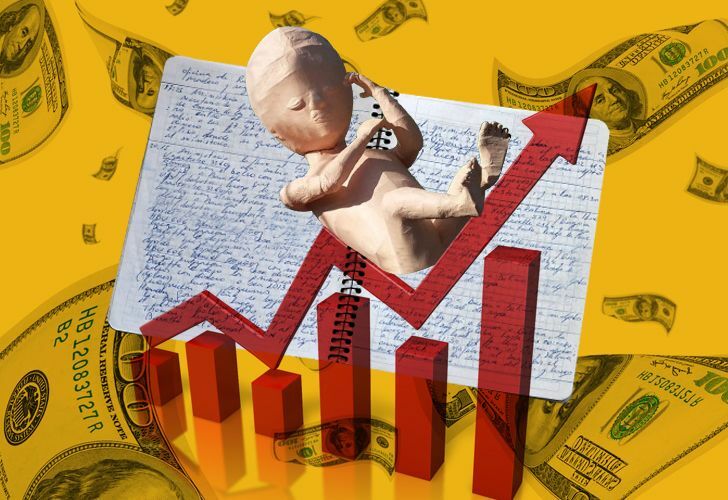 “But legalised abortion also has its uses for the central fiscal problem posed by the government’s agreement with the International Monetary Fund (IMF) – how to halve the deficit when over half public spending is index-linked. Quite apart from the fact that the index-linking does not block savings as completely as generally assumed (thus pensions are due to be upped 28.83 percent by the end of the year when inflation might well be several points higher), this 53 percent of public spending also includes child benefits, which facilitating abortion could slash dramatically over time – Macri’s short cut to ‘zero poverty’ might be an extreme way of expressing this logic. Yet ‘zero poverty’ now looks more distant than ever with some 1.5 million people falling back below the poverty line (according to the UCA Catholic University) to return to a third of the population impoverished. In this context I’m slightly surprised that CFK abandoned her lifelong repugnance for abortion to vote with her caucus, especially because the Pope (along with those picket movements invoking his name and marking Saint Cajetan’s Day so boisterously last Tuesday) could be one of her few remaining friends outside her immediate circle amid all the current corruption uproar. “But anyway your request is for the economic trends behind the headlines. That figure I threw your way in the previous paragraph – that pensions are set to be index-linked 28.83 percent (because the index is based on the inflation two quarters ago) when 2018 price increases could easily be in the mid-30s – is part of a bigger picture which is the key question for the rest of the year in my view (the wage increases from the collective bargaining so far likewise average around 27-28 percent). Inflation is such an acute everyday aggravation that it becomes all too easy to forget that devaluation might well be twice as fast – around 70 percent by the end of the year according to various estimates. “If this equation of devaluation doubling inflation can be maintained, it would do wonders for the balance of payments (especially the trade figures) but there are two main doubts here. Firstly, if the government can continue keeping most people blind to the fact that its index-linking is more notional than real, as well as devaluation outstripping inflation in such a dollarised economy, this would be a juggling-act on a par with introducing an abortion bill in such a way as to have it passed in the lower house and rejected by the Senate. Secondly, nobody should assume that inflation will content itself with closing the year at half the pace of devaluation because it is extraordinarily stubborn. We have that on the authority of the Central Bank no less, which on Tuesday admitted that last month’s inflation was not retreating from the June peak of 3.7 percent as much as they would like – and this might not necessarily be just an excuse to keep interest rates at 40 percent. Devaluation not only outpaces inflation but makes it faster – the steep utility-bill hikes no longer suffice to correct relative prices, necessitating nearly 250 percent more subsidies last month alone. A real headache for reducing the fiscal deficit, which will need to be covered in the 2019 budget whose submission deadline is now only five weeks away.